Bread slurry or oats powder or cornflakes as per your requirementMethodFirst wash the chicken in a vessel and keep it for 5 to 10 minutes to dry the water.Now add lemon juice, ginger-garlic paste, salt, black pepper, garam masala and red chilli powder and mix well.After mixing - Keep it in cold storage for 1 to 2 hours or in the fridge.After this, cornflour in a bowl, slice the bread into a large plate and keep the egg in a separate bowl.Put oil in a pan and keep it on a high flame for hot.Now after the fixed time, put a chicken piece in the first egg solution and then wrap it well then corn flour it in it. 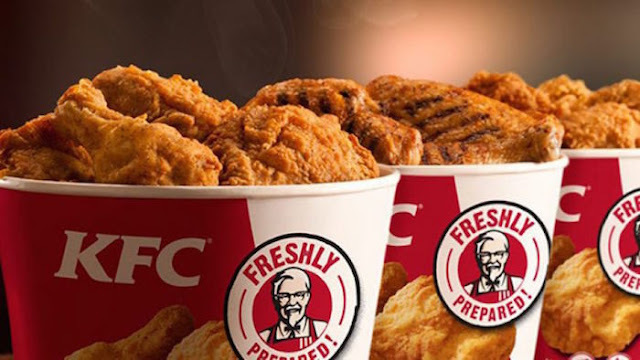 After putting in corn flour, put it again in egg whistle.Finally, wrap the chicken grinded bread into a sawdust and fry it in oil.After adding the oil, add 2-3 grams to it and cook until golden.- Ready KFC-style chicken. Serve it with a sauce and enjoy it yourself.